One of the worst feelings I can experience is failure at following through. I don’t procrastinate. The feeling of having work to do that has yet to be completed is enough to ensure I work before I play. I registered for Wildflower and Vineman before buying a bike. This was, in hindsight, a mistake. I had no experience riding a road bike and had no idea as to whether I’d enjoy it or what the learning curve would be. So, so happy to be done with the Olympic at Wildflower. I dread the bike. Profusely. When I know it’s bike day, I drag my feet out the door to go biking. I don’t enjoy it like I do swimming or running. Through my biking experience, I realize how much I truly enjoy other activities. I haven’t put down enough miles to race Vineman in six weeks. Since Wildflower, I’ve biked a whopping zero times. If I were to jump into training for Vineman now, I would have to bend over backwards to make the mileage happen and potentially do too much too quickly. I’d rather be comfortably trained for my first half Ironman instead of fearful of low mileage and lack of training. Completing Wildflower as my first Olympic triathlon is nothing to scoff at. I’m happy that I emerged from that experience mostly unscathed (minus the worst sunburn ever) and more confident at triathlon racing and logistics. I’m happy that I’m making a decision on what I WANT to do versus what I think I SHOULD do. There will be more half Ironmans; I have plenty of time and opportunity to feel comfortable on the bike and ready to race 70.3. Jesse and I are eying Oceanside in March as a foggier, flatter alternative to Vineman. While I hate admitting defeat, I haven’t really lost anything. I’m excited to be 100% focused on running and strength training for the San Francisco Marathon, and I’m looking into a sprint or Olympic triathlon in the fall. I’m excited to cheer Jesse on at finish line at Vineman this year and envision my own 70.3 accomplishment. Good for you!!! It is definitely important to feel comfortable and prepared!!! You are making the best decision for you!! XOXO!!! Good luck with your training!! I think you made a great decision, since you are not enjoying the bike. There’s really no reason why you should/must/have to do Vineman. You are not being defeated, you are standing up to what you want to do. Thank you!!! You’re right – there’s no must/should necessary. I dread biking too! Making a decision not do a race is tough and takes more courage than doing a race sometimes. You’ll do it when you’re ready. The San Francisco Marathon is going to be amazing! 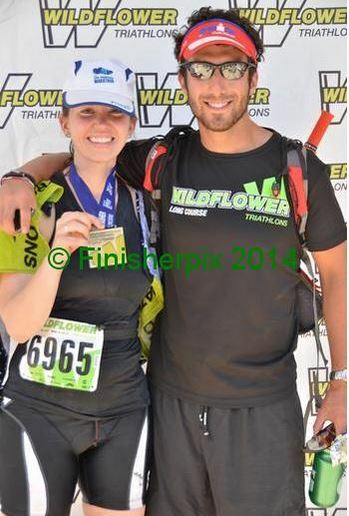 Completing Wildflower was amazing and you rock for that. The San Fransisco Marathon is equally awesome. Sometimes changing plans is the best decision! Good luck with marathon training! Sounds like the right decision. I raced the course last year as I took place in Barbs race 2 weeks after the official IM event and while it is not massively challenging, its tough enough to not be scoffed at and you have to be prepared for the ride and the subsequent ‘bringing your legs back to life’ run. You always have such a great attitude. I completely understand. I tried to find a love for the bike and I just couldn’t. When my husband and I were recently engaged we tried a 52 mile bike ride together. I was so pissy by the end that we almost got un-engaged. It took me years to get to the point where I feel somewhat confident on the bike, so I definitely understand the sense of dreading the bike. Maybe taking that pressure off will let you, with time, enjoy biking. In the meantime, good luck with your marathon training! Thank you!!! I agree, I think with the lack of pressure, I may feel better about it.